This Fellowship program provides stipend support for master’s and doctoral students to engage in thesis and dissertation-related research during the summer (May 21-August 10, 2018) under the guidance of their advisor. To be eligible, students must be enrolled in one of the College’s thesis or dissertation-based graduate programs and be in good academic standing. They are evaluated based on the strength of the proposed research/creative activity along with the student’s academic record. Of 98 applications received, 13 Fellowships were awarded. 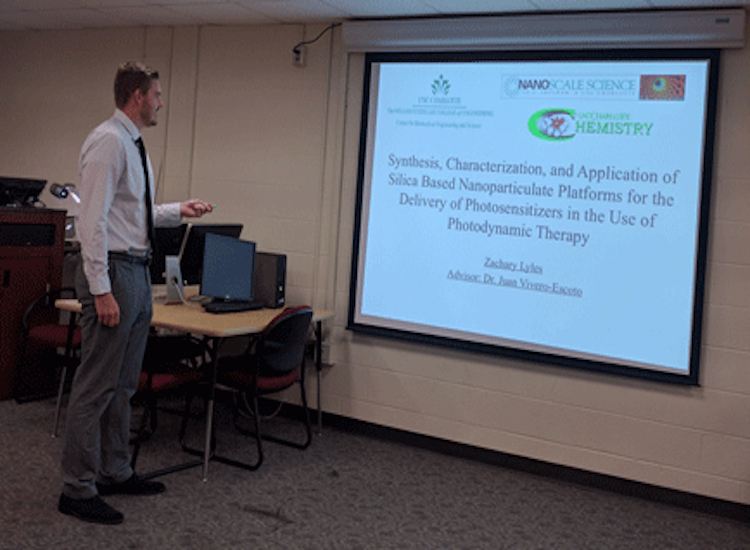 Congratulations to Zachary Lyles, a Ph.D Nanoscale Science student on receiving this award for his research "Chlorin e6 and cisPlatin loaded Mesoporous Silica Nanoparticles for the Synergistic Treatment of Triple Negative Breast Cancer".